A person as young as 18 can file for Social Security disability benefits if he or she is suddenly unable to work because of a disability or illness. At least 10,000 Social Security disability applications are filed in the United States every year by people with a qualifying medical condition. That is, a medical condition expected to last for at least a year or result in death, according to the Social Security Administration. People whose claims have been rejected may not apply for Social Security benefits for at least another 60 days after the agency rejects their application. If you need your application processed immediately, you may want to list level impairments in your application. If you are applying for Social Security disability benefits in Indianapolis, we at the Hankey Law Office can provide you with legal assistance. Get in touch with a qualified member of our legal team by calling our offices at (317) 634-8565 or (800) 520-3633 so we can work on getting your application processed as soon as possible. When businessman and reality television personality Donald Trump won the 2016 United States presidential elections, various groups advocating for different people such as refugees, illegal immigrants, and members of the LGBTQ community took to the streets to protest his victory. But there is another group that has the possibility of being disenfranchised under a Trump administration—the disabled. These are people who are blind or disabled adults and children or aged 65 or older who meet stringent income and asset limits ($2,000 for singles, $3,000 for married couples). In the House of Representatives, Vice President-elect Mike Pence has consistently called for legislative efforts to slash benefits in Social Security, Medicare, and Medicaid, and is in favor of privatizing said institutions. There is also a likelihood that the Trump administration, together with the Republican-led House and Senate, will turn as many federal programs as possible into “block grants”, meaning that a state can receive funding and instead of earmarking said funding for a specially allocated program, the state can now use the money for whatever purpose it see fits. The process of applying for and actually claiming Social Security disability benefits is often lengthy and time-consuming—a task that someone who is recuperating from an illness or who has had to suffer from a long-term injury may not be up to. Call our attorneys at The Hankey Law Office in Indianapolis at (317) 634-8565 or (800) 520-3633 if you need legal help with this process. The Social Security Administration provides disability benefits to American citizens who lost the ability to work because they contracted an illness or a disability expected to last at least a year or result in death. If a disability claim is approved, the benefits that a person can expect to receive are based on his or her average lifetime earnings. If a disability claim is denied, one is afforded the chance to appeal the claim. Once a claim is approved, initial Social Security disability benefits will be paid out six months after the date one contracted the disability at issue. Our attorneys at the Hankey Law Office provide legal services for our clients in Indianapolis and handle Social Security disability benefit issues such as filing for or appealing a Social Security disability claim. Seek the legal assistance of the experienced members of our legal team by calling our offices today at (317) 634-8565 or (800) 520-3633. Monthly payouts of Social Security benefits vary by recipient type, so here’s a breakdown of the average amount of Social Security benefits each recipient receives per month and how to estimate what you might receive. About 72% of Social Security benefit recipients are collecting retirement benefits, either because of their own work record or the work record of their spouse or parent. 43.8 million retired workers are receiving $1,349.59 monthly; 2.4 million spouses of retired workers are receiving $700.82 monthly; and 600,000 children of retired workers are receiving $652 monthly. About 10% of Social Security beneficiaries are receiving survivor benefits. That is, they are receiving benefits on behalf of a deceased relative or guardian. They are composed of 1.9 million children of deceased workers receiving $832.78 monthly; 100,000 widowed parents of dependent children receiving $942.62 monthly; 300,000 disabled widowers receiving $716.95 monthly; and 3.8 million non-disabled widowers receiving $1,293.24 monthly. Last but not the least, 18% of Social Security recipients obtain disability benefits, and they are composed of 10.7 million disabled workers who receive $1,166.41 monthly; 100,000 spouses of disabled workers who receive $322.56 monthly; and 1.7 million children of disabled workers who receive $351.29 monthly. If your Social Security disability claim has been rejected, seek out the legal assistance of an Indianapolis disability attorney at the Hankey Law Office by calling our offices today at (800) 520-3633. United States Democratic vice-presidential candidate Tim Kaine gave a specific answer as to what former Senator Hillary Clinton would do to solve the shortfalls of the Social Security benefit fund if she become president. The plan is to remove the cap on how much of a worker’s income can be subjected to payroll tax, which helps to fund Social Security. Former Democratic presidential candidate and U.S. Senator Bernie Sanders had the same idea. He proposed removing the $118,500 cap on individuals earning wages greater than $250,000 a year. Other options to solve the shortfall problem include legislating a lower benefit payment every month. Unfortunately, this move could lead to political suicide because so many voters belong to the elderly group that receive said benefits. If you are injured in an accident and find yourself unable to work to earn wages for your living expenses, you can ask financial assistance from the Social Security Administration by filing for disability benefits. 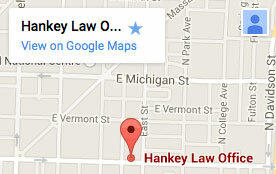 Do so with the legal help of our attorneys at the Hankey Law Office in Indianapolis by calling our offices today at (800) 520-3633. Albuquerque, New Mexico-based REDW Stanley Financial Advisors senior financial planner David Cechanowicz said that a person who is receiving monthly Social Security disability benefits has good news for their spouse – the partner can claim spousal benefits as soon as they reach 62 years of age. Spousal benefits are limited to 50% of a person’s primary insurance amount (PIA) – or the benefit (before rounding down to next lower whole dollar) a person would receive if they decide to begin receiving retirement benefits at their normal retirement age. Cechanowicz tells prospective benefit recipients, “If you were to wait until age 70, your retirement benefit should be at least $2,904 per month, without cost-of-living increases. All spousal benefits and benefits for all auxiliary beneficiaries are lost during periods of suspension,” meaning families have to decide whether they want current household income or ultimate survivor benefits. Our attorneys at the Hankey Law Office will be with you every step of the way of the initial filing process if you wish to receive monthly Social Security disability benefits. Contact us by calling our Indianapolis offices today at (317) 634-8565 to seek our legal assistance. The Social Security Administration, through its Supplemental Security Income programs, can provide federal assistance to children who are suffering from various ailments, including dreaded cancer. To apply for this type of assistance, view the Child Disability Starter Kit and familiarize yourself with what the program is all about. Find and fill out the online Child Disability Report. At the end of the report, you will need to sign a waiver that asks for your permission to allow the child’s doctor to divulge information about your child’s illness to the agency. This information is vital to how the judges will decide your child’s case. Aside from protecting your child’s welfare, the SSA takes seriously its obligation to applicants who are in an advanced state of illness or those who are suffering from severe stages of disability. Via the Compassionate Allowances program, the SSA expedites the cases of applicants who qualify under the listing of impairments that are considered serious. Filing for Social Security disability benefits or appealing a rejected claim can be a difficult and time-consuming process. If you are someone who is recuperating from a debilitating illness and who needs financial assistance, ask help from the federal government with the legal help of our attorneys at The Hankey Law Office in Indianapolis by calling our offices today at (317) 634-8565 or (800) 520-3633. 15 years after initially filing for Social Security disability benefits based on degenerative disk disease, obesity, depression, and other ailments, 47-year-old Louquetta O’Connor-Spinner is still fighting the rejection of the Social Security Administration. If you need legal help filing for Social Security disability benefits or appealing rejected Social Security disability benefit claims, get in touch with our Social Security disability attorneys at the Hankey Law Office in Indianapolis. Call our offices today at (317) 634-8565 to discuss your case.